The cell. 5. Vesicular trafficking. From the reticulum to the Golgi. Atlas of plant and animal histology. The cell. 5. Vesicular trafficking. Most proteins and lipids leaving the endoplasmic reticulum are packaged in vesicles or incorporated in tubulo-vesicular compartments that are detached from the endoplasmic reticulum membrane (Figure 1). They are shipped to the Golgi apparatus. There are ribosome-free regions distributed along the endoplasmic reticulum membranes, referred as transition zones or ER exit zones, where vesicles and their cargoes are assembled. Transition zones are about 0,5 µm in length and, at least in mammals cells, are quite stable in both time and space. Figure 1. COPII (coat protein II) vesicles are released from the transition zones of the endoplasmic reticulum, are moved away, and fused between each other forming the ERGIC (endoplasmic reticulum-Golgi intermediate compartment), which moves toward the cis face of the Golgi apparatus. In animal cells, vesicles and ERGIC movements are mediated by microtubules and motor proteins. In the cis side of the Golgi apparatus, all the ERGIC bodies and some vesicles from the endoplasmic reticulum coming from different parts of the cell form the cis cisternae of the Golgi apparatus. At the same time, from the ERGIC and cis cisternae, COPI coated vesicles are released and travel toward the endoplasmic reticulum in a recycling process. Transition zones are associated with the Golgi stacks. They are close to each other. This makes sense because the communication is more efficient. Vesicles don't need to travel long distances and the existence of the Golgi apparatus itself depends on a continuous process of vesicle incoming. It has been observed that a new transition zone led quickly to the nearby formation of a new Golgi stack. On the contrary, if a transition zone disappears, the associated Golgi cisternae are also lost. Transition zones can fuse with others and one transition zone can be split in two. Their associated Golgi stacks match this behavior. Vesicles budding from the transition zones are COPII coated vesicles ( COPII: coat protein II; Figure 1). Several proteins are involved in the formation of this COPII molecular framework: Sec16, Sar1 GTPases, Sec23/24 and Sec13/31. In this order, they are assembled at the cytosolic surface of the transition zone membranes. Transition zones are the more suitable environments for the assembling of COPII coats by having a particular membrane lipid composition and a higher concentration of the protein Sec16, which recruit Sec23/24 proteins, that in turn recruit Sec13/36. COPII proteins participate in two mechanisms: a) vesicle formation and b) selection of cargoes. a) COPII proteins, mostly the external layer formed by Sec13/31, are involved in the formation of the vesicle. To do this, they induce the bending of the membrane by producing mechanical tensions and folds in the membrane for form the vesicle. Furthermore, COPII proteins are thought to participate in the excision of the vesicle. b) Two types of cargoes are going to be transported: transmembrane cargo and soluble cargo. Soluble cargoes must be "fished" by transmembrana receptors. The cytosolic domains of both, transmembrane cargoes and receptors, are recognized by COPII proteins and included in the vesicle. The recognition is mediated by Sec 24 proteins. Thus, COPII proteins are needed for selecting molecules to be transported in the vesicle. In addition, any protein to be transported has to be properly folded. Otherwise, it will be removed from the endoplasmic reticulum before the recognition. A quality control of proteins is always at work in the endoplasmic reticulum. COPII coated vesicles are released from the transition zones of the endoplasmic reticulum, they partially lose the protein coat, and are fused together to form the ERGIC (endoplasmic reticulum-Golgi intermediate compartment) or tubule vesicular transporter, which is moved by microtubules and motor proteins toward the cis face of the Golgi apparatus. All the ERGIC bodies arriving at the cis face are fused to form the cis cisternae of the Golgi apparatus. COPII coated vesicles is the usual way to travel from the endoplasmic reticulum to the Golgi apparatus. However, there are alternatives, or variations, to this vesicular mechanism. For example, a typical COPII vesicle of about 60-90 nm in size, cannot enclose a pro-collagen molecule, which is 300 to 400 nm long. Likewise, chylomicrons traveling from the reticulum to the Golgi apparatus need larger special vesicles. It looks like that the activity of the Sar1 GTPase is important for modifying the vesicle coat and then produce vesicles larger than 500 nm, where larger molecules can fit. Bidirectional trafficking between endoplasmic reticulum and Golgi apparatus has two roles: getting back resident proteins and keep constant the sizes of both organelles. ERGIC compartment matures during the journey to the Golgi apparatus. This maturation process brings a progressive change of the molecular composition of its membrane that in turn allows the attachment of some cytosolic proteins, such as COPI coat molecules. In this way, COPI proteins are recruited to the ERGIC and Golgi cisterns membranes. The COPI vesicle formation mechanism is similar to that of COPII vesicles, but COPI vesicles are targeted to the endoplasmic reticulum with lipids and endoplasmic reticulum resident proteins. This is a recycling pathway. COPI coated vesicles brings back membrane for replacing the membrane used to form COPII coated vesicles. In addition, they transport v-SNARE and recepetors needed for selecting cargoes to be included into the COPII coated vesicles. Resident proteins perform their functions in the endoplasmic reticulum, but not in the Golgi apparatus, and may enter by diffusion into COPII vesicles while budding. The number of COPI vesicles depends on the amount of endoplasmic reticulum resident proteins present in the Golgi apparatus/ERGIC compartment since these proteins stabilize the COPI coat. Another recycling mechanism mediated by tubular structures between endoplasmic reticulum and Golgi apparatus/ERGIC compartment has been suggested. Selection of resident proteins in the ERGIC/Golgi compartments is done in two ways. Resident transmembrane proteins are recognized by COPI molecules, whereas soluble resident molecules are selected by KDEL receptors. Both, transmembrane and soluble resident proteins have particular amino acid sequences. 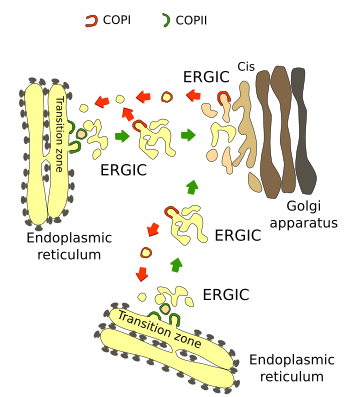 COPI coated proteins are released from the ERGIC/Golgi compartment, moved toward the endoplasmic reticulum, and fused with it, releasing the transported molecules. KDEL receptors commute between the endoplasmic reticulum and the Golgi apparatus. They are able to travel in both COPII and COPI coated vesicles. KDEL receptor recognizes endoplasmic reticulum resident proteins in the ERGIC/Golgi apparatus, and receptor-ligand complex is then included into COPI vesicles. In the endoplasmic reticulum de resident protein is dissociated ,and KDEL receptor is included in COPII coated vesicles. The mechanism for binding the ligand in one compartment and releasing it in another is based on the pH differences between both compartments. Endoplasmic reticulum pH is more basic and the affinity of KDEL receptor for its ligand is very low. However, in the ERGIC/Golgi apparatus compartment the pH decreases, which in turn increases the affinity of KDEL receptors for endoplasmic reticulum resident proteins. Thus, pH is the key element for this recycling mechanism. Antonny B, Schekman R. 2001. ER export: public transportation by the COPII coach. Current opinion in cell biology. 13:438-443. Saito K, Maeda M, Katada T. 2017. Regulation of the Sar1 GTPase cycle is necessary for large cargo secretion from the endoplasmic reticulum. Frontiers in cell and development biology. 5: 75. Zanetti G, Pahuja KB, Studer S, Shim S, Schekman R. 2012. COPII and the regulation of protein sorting in mammals. Nature cell biology. 14: 20-28.